Today’s guest(s): Gregory Tracy, Managing Editor of the Pilot; Father Roger Landry, Executive Editor of The Anchor. Summary of Today’s Show: Scot is joined by the Thursday roundtable and discusses a new Catholic-themed movie, a fundraiser for teens by teens in Weston, Respect Life Sunday, and more. 1st Segment: Scot and Susan lamented the Red Sox collapse last night – but moved on quickly in order to not be too depressing! Susan asked Scot what’s been going on with him. Scot said it was a busy week in the Pastoral Center, with a visit from Msgr. Andrew Wadsworth from the International Commission on English in the Liturgy and presentations. Scot said he is also headed to Kansas City tomorrow for the Catholic New Media Conference organized by the Star Quest Production Network. He continued and said he was disappointed that he signed up for the conference before he knew this weekend was also the CatholicTV telethon – it is the first time in a long time that he hasn’t been able to participate. Susan agreed that CatholicTV was an important part of evangelization in the Archdiocese. 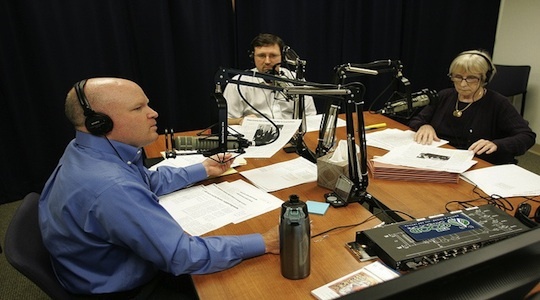 Scot said he participated in the launch of a new Catholic radio station – 1230AM, WNEB in Worcester this past Sunday – a station called Emmanuel Radio. 2nd Segment: Scot started out by discussing a new movie from Emilio Estevez and Martin Sheen called The Way – a story about an ancient Catholic pilgrimage called the Camino de Santiago (or “Camino” for short). Scot commented that he hadn’t know until the premier screening that Martin Sheen took his last name after Bishop Fulton Sheen. Greg said everyone asks him what he thought of the film – overall, Greg said, he thought it was a good movie. Many movies have a religious theme, he continued, but start with the end and fill in the gaps. He said The Way, on it’s own merits and with a secular point of view, was still a good character-driven music. Scot agreed it was a good movie for both Catholic and secular audiences. Scot took a minute to congratulate the occasional fill-in cohost on The Good Catholic Life, Father Chip Hines, on his recent appointment to St Martha parish in Plainville. He had been serving as the administrator at that parish. Scot brought up a story in the Pilot about students in Weston are using social media to help fundraise for the Cor Unum meal center in Lawrence. Greg said that the fundraiser, entitled “Feeding Frenzy,” is special because it is particularly geared towards teens and students to help feed other teens and youth. Greg highlighted that the Cor Unum meal center is different from a standard soup kitchen because it not only serves 3 meals a day, but serves them sit-down style – not in a cafeteria line. Greg said the goal is to raise about $25,000 to help fund the meal center. Scot highlighted two great stories in the Pilot with pictures this week – one about the Celebration of the Priesthood dinner last Thursday, and one about the Blessed John XXIII Lawn Party. Both events were very successful, Scot continued, and raised money for senior priests and the seminary respectively. The last piece of local news Scot brought up was the combination of two Catholic high schools – Trinity Catholic Academy in Newtown and Mount Saint Joseph Academy in Brighton – to form a new high school named Saint Joseph’s Preparatory High School. The new school will be located on the current campus of Mount Saint Joseph Academy and serve a co-ed student body of approximately 400 students. 3rd Segment: Scot reminded everyone that it is Respect Life Sunday this coming Sunday. Cardinal Daniel DiNardo, chair of the USCCB committee on Pro-Life activities spoke persuasively about threats to life, Scot said. “The unborn child, the aging parent who some call a ‘burden’ on our medical system, the allegedly ‘excess’ embryo in the fertility clinic, the person with a disability, the cognitively impaired accident victim who needs assistance in receiving food and water to live—each today is at risk of being dismissed as a ‘life unworthy of life’,” Cardinal DiNardo said. Scot said he thought it was good that the Cardinal was so specific about the precarious life situations that need help from all people of good will, not just Catholics. Susan said that the focus on Respect Life Sunday is sometimes just on the abortion issue, but she agreed that Cardinal DiNardo reminded us we need to consider the “womb to tomb” fight for life. Scot said that Bishop Robert Hennessey will celebrate a Respect Life Mass at the Cathedral of the Holy Cross at 11:30am on Sunday, followed by the Mass Citizens for Life Respect Life Walk at 1:30pm. Fr Roger said that the walk is an important way to energize the community to think about pro-life issues, especially because of all the protestors who remind us that our views aren’t always held by others. Scot highlighted another testimonial from a participant in Project Rachel, a ministry in the Archdiocese of Boston that helps women who have had abortions seek healing. Greg said that it is sad that more people haven’t heard about Project Rachel and the wonderful work they do, and that the Pilot will be publishing a series of letters from participants every week throughout the month of October. Susan said that the retreats are a one day event, but the work that goes on is a blessing to the Church and to the women who participate. Scot brought up that Fr Roger’s editorial in the Anchor this week is entitled “A Commonwealth of Kevorkians, or Good Samaritans?” Fr Roger said he was trying to give an echo for the readers in Fall River of Cardinal Sean’s comments at the Red Mass in Boston last weekend about the attempted legalization of assisted suicide in Massachusetts. Fr Roger continued, saying that the editorial is a herald call for people to make them aware that the issue is again on it’s way. He said we need to have a campaign to educate citizens to prepare them for the possibility that the initiative may make it to the ballot next November; a campaign that will inform citizens to talk to their coworkers and family about the value of life. Fr Roger said that we need to acknowledge that we can never help someone commit suicide – Scot added that if someone is on a bridge thinking about jumping, we would never consider pushing them off – we’d always try to talk them down. Scot reminded everyone that all suicide is a tragedy. 4th Segment: Scot and Father Roger opened the segment by discussing Pope Benedict’s addresses to the German people this past week. Scot said he imagined it was an important trip for the Pope, who is trying to fight against secularization in his home country. Fr Roger said the first and most important thing Pope Benedict did was help German Catholics remember that the Church is not just a society of individual people, but a real communion of inter-related people giving witness to God’s own love for us. Fr Roger said that the Pope seemed to be speaking out against institutionalism, something we need to hear in the United States as well. Fr Roger continued and said that Pope Benedict was also emphasizing an ecumenical spirit with a visit to Martin Luther’s birthplace and talking about Luther’s search for God – Fr Roger said that every one of us as Catholic Christians need to continually have the same hunger for God within our Church. Lastly, Fr Roger said the Pope wanted secular Germans to remember they always need to be grounded in truth. Susan said that a message she took from the Pope’s visit was that “where there is God, there is a future.” Susan also said she was surprised at a comment from CNS that the Pope was connecting on a high level – she said it isn’t a surprise to her as the Pope is a renowned academic. Scot said his favorite quote from the Pope’s addresses was emphasizing that a new strategy was not needed to re-evangelize people, but rather seeking total transparency. That is why it is particularly upsetting, Mr. President, when your Administration, through the various court documents, pronouncements and policies identified in the attached analysis, attributes to those who support DOMA a motivation rooted in prejudice and bias. It is especially wrong and unfair to equate opposition to redefining marriage with either intentional or willfully ignorant racial discrimination, as your Administration insists on doing. Scot emphasized that the Archbishop is trying to call the President out about failure to follow campaign promises about the meaning and value of marriage and the family. Father Roger concluded the show by saying that Archbishop Dolan has “taken the gloves off” – in the past, the bishops have been very courteous, but that the President’s distancing from promises should make citizens reflect whether or not he represents their views on the issue.